Do you eat breakfast every morning? With some of our busy schedules, many of us assume that breakfast is the one meal a day we can skip. I know I’m guilty of this sometimes, especially since I am one of those girls who seems like she is constantly on the go. While my husband is a big fan of cereal, I am a hot breakfast girl, which means sometimes finding hot, fast solutions isn’t easy. 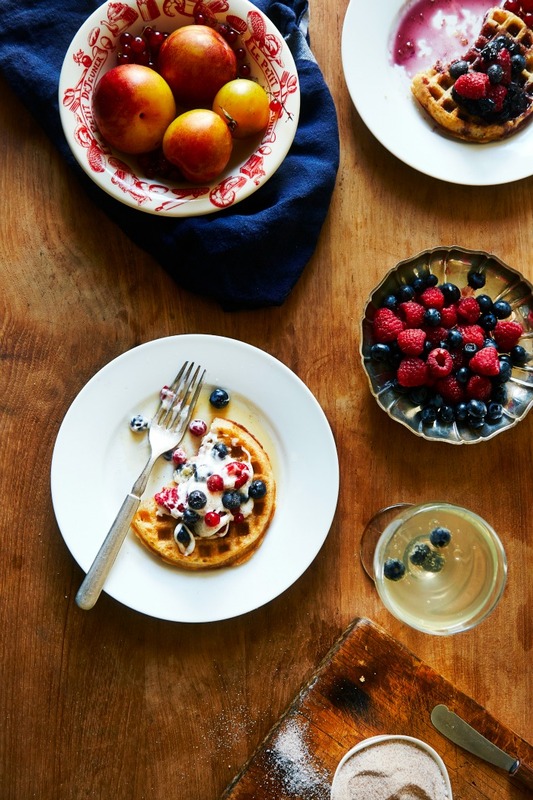 Luckily, Van’s Foods has a variety of quick frozen waffle and pancake options that are not only all natural, many of them are gluten-free, giving me healthier options in the morning that easily fit into my weight loss routine. 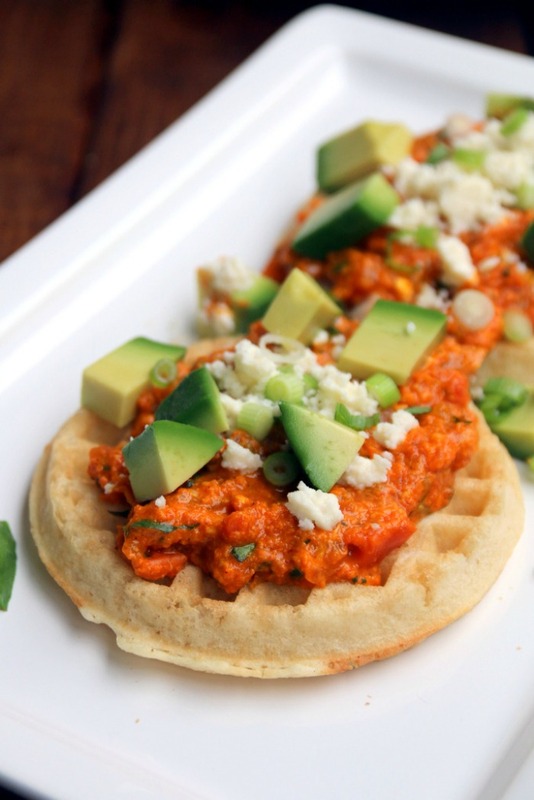 One of my favorites is their Gluten Free Ancient Grain Waffles. These waffles are made from a mix of nutritious whole grains including brown rice, millet, teff, buckwheat, amaranth, sorghum and quinoa. With 43 grams of whole grains and 6 grams of fiber per serving, they are an awesome quick breakfast for a busy girl like me. As well, they are a perfect bread substitution in many recipes, allowing you to make an easy breakfast sandwich or use your imagination to make a yummy, healthy breakfast everyone in your family will love. In celebration of National Hot Breakfast month, we are excited to be working with Van Food’s to share with you some of their best hot breakfast recipes. These yummy recipes are not only easy to make, but great for impressing even the pickiest eaters in your household. You may even find some creative new additions to your breakfast routine. To see the recipe, make sure to click on the picture of the recipe below (all pictures are courtesy of Van’s Foods). What is your family’s favorite hot breakfast? Make sure to tell us in the comments below! Disclosure: Budget Earth did not receive monetary compensation but may have received products for review purposes. All recipes and pictures provided, courtesy of Van’s Foods. Please do not reproduce these images without their consent. All opinions on this product are my own and may differ from our readers’ opinions. These look great! Thanks for the new ideas. I would love to try the Greek English Muffin or those creamy tomato scrambled eggs for breakfast. I love avocados for breakfast on an english muffin with crushed red pepper. My family loves to have omelets for breakfast with bacon and toast on the side. Omelets are versatile and perfect for picky eaters. Everyone gets to choose their own ingredients. These look so delicious! 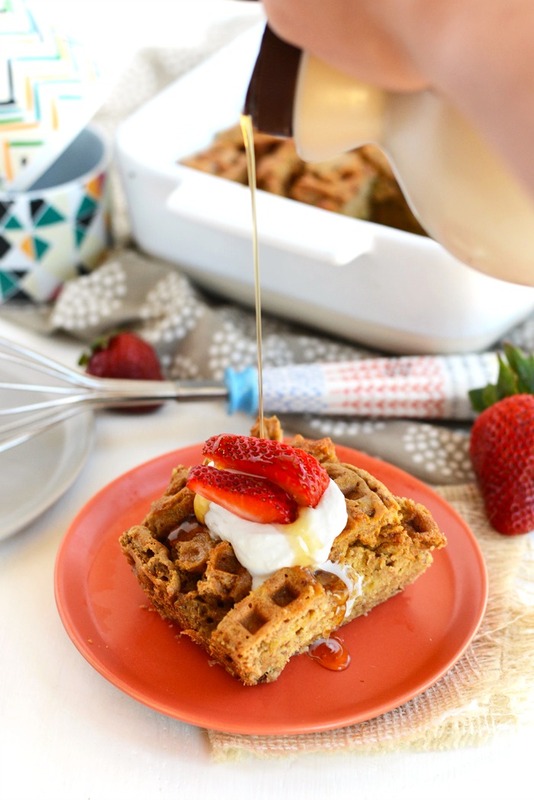 I love the waffle french toast bake. It’s exactly the kind of breakfast my family loves. Can’t wait to try these! I love waffles. 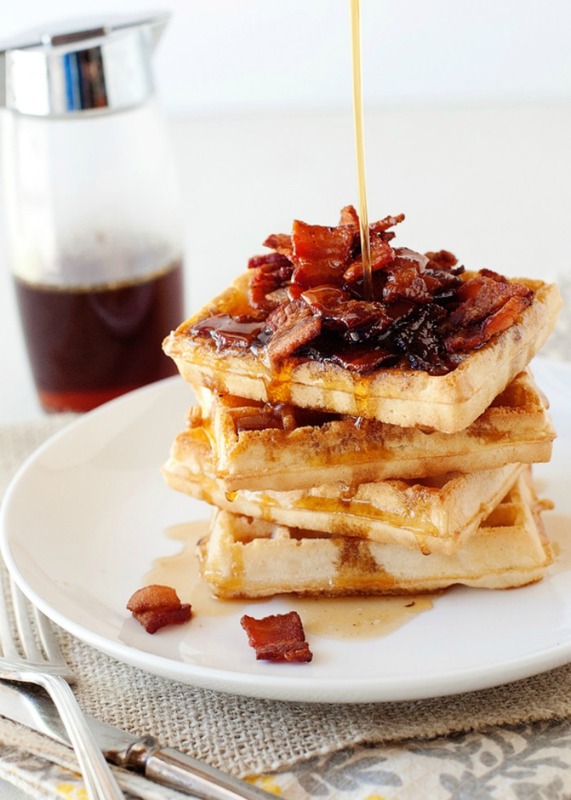 I think that the waffle idea with the maple and the bacon would be a great hit with my family. Hooray for easy organic non gmo breakfast. Excited to try some of these recipes out. Hot breakfast month? I’m not a breakfast eater. I do enjoy waffles. The peaches and cream sounds pretty good. Vans waffles are really good. The chocolate covered waffle bites look very tempting. 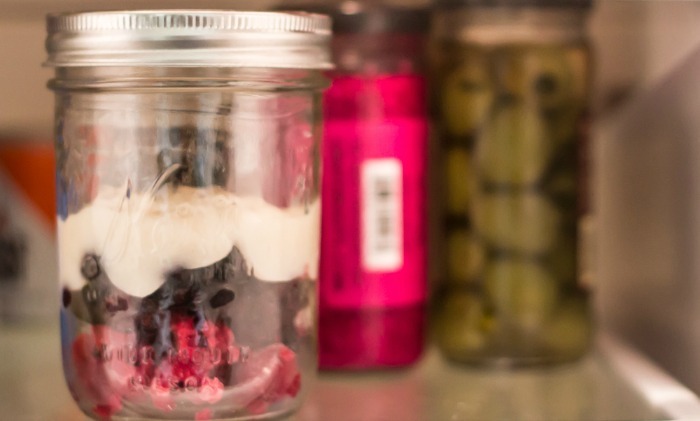 I have always wanted to try the breakfast in a jar idea. the kids are big fans of pancakes and waffles. basically anything with syrup. 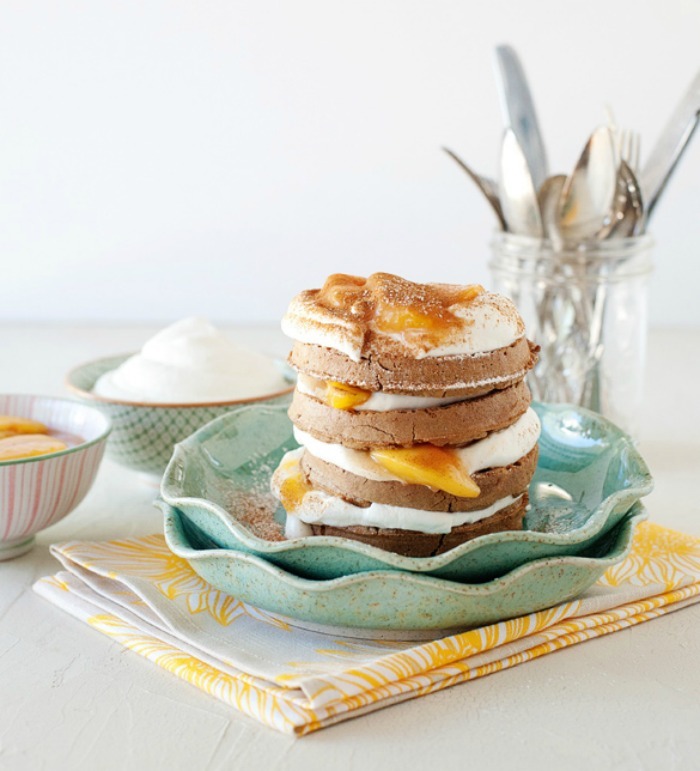 the peaches and cream waffle stacks look amazing. peaches are one of the few fruits i know my whole family eats. I really love all these recipes. My favorite is Waffles with Creamy Tomato Scrambled Eggs. I would love to try. These look amazing! I love the bright colors. I’m definitely going to try that tomato scrambled eggs recipe! These look scrummy! Love them all especially those Belgian Waffles with Bacon Maple Syrup! These all look amazing. I’m so used to the same 4-6 things for breakfast. I need to get pinning for later,lol. I’m always looking for new breakfast recipes. Especially ones I can fix for supper. I need to get in the habit of eating breakfast more often; these are great ideas that I’d like to try! I love making breakfast and these look so yummy. I rarely eat breakfast, which is not good for me, but it happens. These are some good ideas for a quick one. Oooh those peaches and cream waffles look amazing!! Breakfast is truly my favorite meal of the day!! Yum! 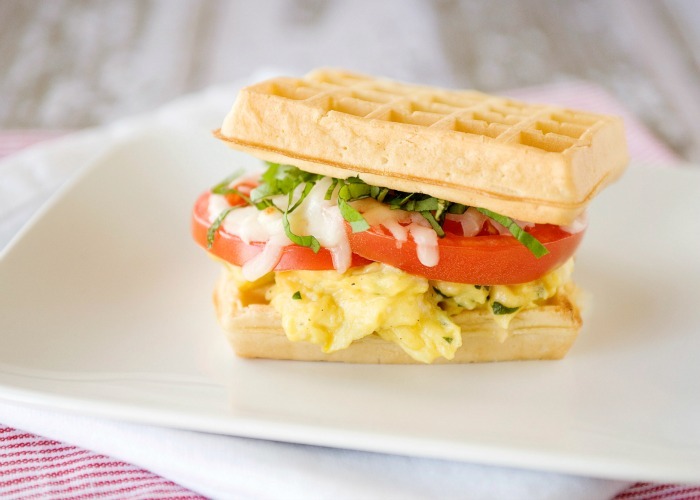 I can’t wait to make the Caprese Waffle Sandwiches! 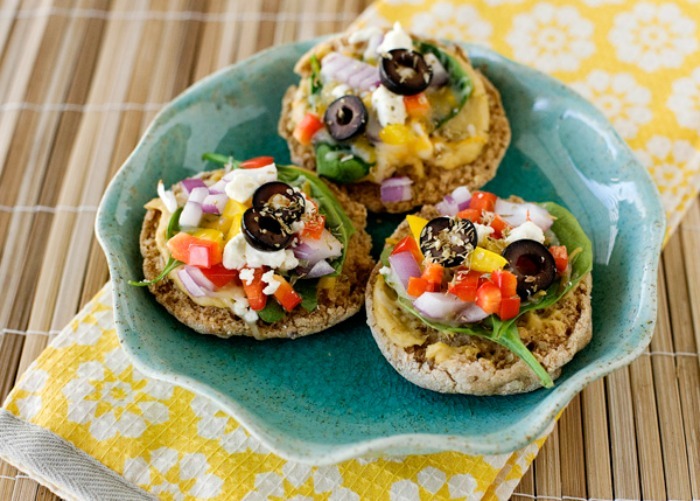 I am always looking for creative breakfast ideas since my creativity usually doesn’t kick in until late afternoon! I thought the suggestions were all great and I especially like the ones that incorporate chocolate! Love creative ideas for breakfast since my creativity doesn’t kick in until late afternoon! I like them all but especially the ones that incorporate chocolate! Wow!! These all look so delicious and healthy!! I think my kids would even enjoy these and they look really easy to make!! I am definitely going to try these recipes!! The peaches and cream waffle stacks and the Greek style English muffin pizzas would be a hit here. I need to get a few warm breakfast options i the house. Thanks for reminding us that breakfast is a must too. Great ideas here and some I already use. Thanks for sharing. I’d like to try the ancient grains waffles. With blueberries. The Greek muffin looks really tasty! It’d be great for weekend brunches when I’ve got a bit more time! I do have breakfast each morning. Sometimes I just take a yogurt and nuts to work, but I do enjoy a hot breakfast too. The Gluten Free Ancient Grain Waffles do sound terrific. Wow, These are all wonderful ideas and they are so simple. I loved the Baked Blueberry Waffle Brunch. I will definitely make it at home. This is a great list of breakfasts! I think that the Belgian Waffles with Bacon Maple Syrup looks amazing. My family would really enjoy them! We are breakfast lovers around here, it is hard to pick just one. I guess our fave is avocado toast topped with a poached egg. Love the peaches and cream, the mixed berry waffle, and the Greek waffle looks interesting. Thanks for the suggestions! Checking these out for a brunch tomorrow. Thanks! 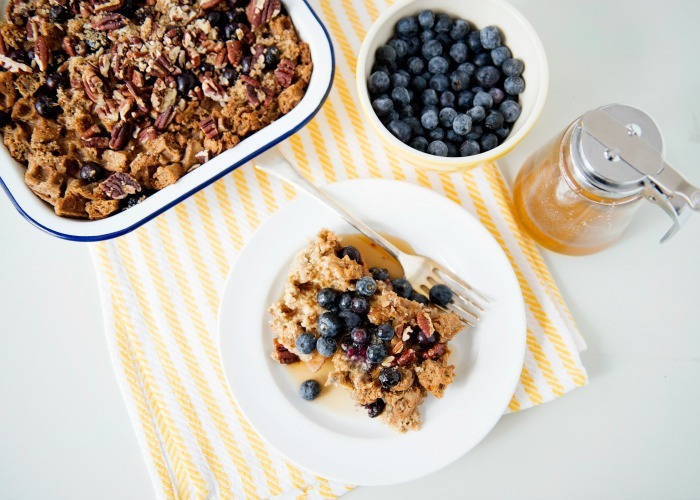 Oh my goodness, all of these breakfast recipes are making my mouth water, yum!! 🙂 The Begian Waffles with Bacon Maple Syrup particularly caught my eye. I can’t wait to make some! Oh so many nice recipes. 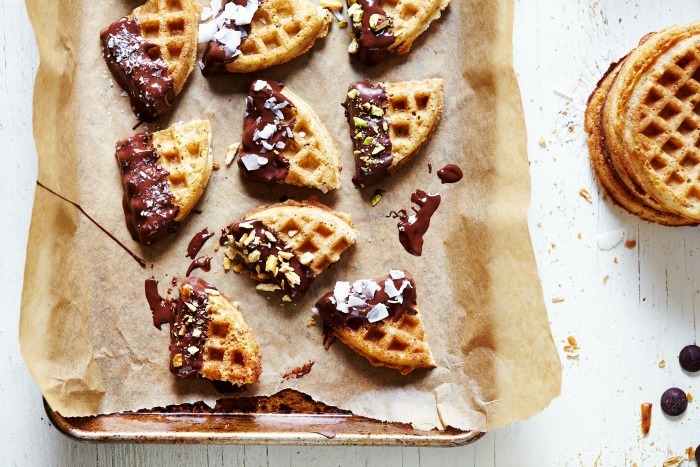 I want to get a waffle maker so I can make some of these, esp with buckwheat flour!